We offer a spiritual path to discover more of your innermost, true Self, and to directly experience higher states of consciousness. We are honored to have you visit us! All audio is available in both streaming and download format. Many audio products are still available in CD format, while supplies last. You can enroll in one or both. They work together and complement each other. You are a graduate if you have completed the basic Awakening Your Light Body course either through DaBen and Orin or a teacher. Graduate Light Body Students - Click on the picture or go here for suggestions on what to study next. You can view a list of all our light body classes by levels (scroll down) here. You can view a list of all our light body courses here. Sanaya's Soul Love Audiobook, Printed and eBook and Soul Love Audio Courses. Our books have been translated into over 26 languages, over 3,000,000 in print. We thank all of you for all the light you are adding to the world as you open to the divine within you. Orin and DaBen Single guided audio meditations in download format on a variety of topics to assist you in having a more joyful, loving and abundant life. $7 each. Read and learn to channel by Orin and DaBen:Opening to Channel book. Audio Course: Opening to Channel, Connecting With Your Guide (C101) that goes with the Opening to Channel book is by Orin and DaBen who will join their energy with yours to assist you in opening to experience your guide. Orin brings you this channeling course to assist you in receiving clear guidance, whether you are just beginning to channel or have been channeling for years. Connect with a guide and bring through guidance you can trust and that is clear enough to act on. You can learn to receive guidance directly into your mind, or channel it aloud. Read Orin and DaBen's Creating Money book on how to attract money and abundance by following spiritual principles. These 8 Creating Money meditations by Orin work with your higher self and soul to reprogram your subconscious for abundance and prosperity. If you continually experience lack and would like to transform your abundance potential, use these journeys over and over. Orin, channeled by Sanaya, created these courses to assist you in opening to the infinite possibilities for good that await you in every area of your life. These are some of Orin's most uplifting journeys that will take you into wonderful, vastly expanded states of consciousness where you can experience and know your true identity. Manifest with Divine Will: Join the free Divine Will study group Links to read and study each quality of divine will. Experience this exercise on how to manifest with Divine Will. 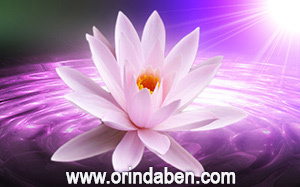 Orin's Divine Will and Divine Will Manifesting Courses - our most powerful manifesting courses! All of Orin's courses (brought through by Sanaya Roman) on Divine Will teach you how to manifest and transform your consciousness by aligning with Divine Will. In this way what you create will fulfill you and add light to your life and to the world around you. DaBen and Orin's basic Awakening Your Light Body series is a six-part home-study audio course that includes a manual with extensive written information. The light body is a vehicle of light you create that will allow you to sense and work with higher, finer energies and transform your personality, consciousness, thoughts, feelings, situations, relations and your life circumstances to a higher vibration. It offers spiritual awakening as you progress through the levels and explore increasingly higher realms and dimensions, open to your soul and spirit, and meet and work with masters, guides, and evolved beings. 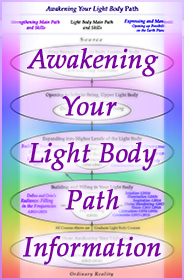 View the Awakening Your Light Body Path for an overview of the light body path and some of the states of consciousness that are offered at each of the 5 levels. Already a light body graduate? Read Light Body Graduates, What is Next? for suggestions. Upcoming Live and Online Graduate Light Body Seminars: Go here for Schedule Next Light Body Graduate seminar in Medford, Oregon April 26 - May 1st with Duane and DaBen. View a PDF Version of Our Current Newsletter, click on the picture to view a PDF newsletter containing links to our website. This is also an excellent way to navigate our website. Note: PDF file is large, allow time for it to load. Want a free printed newsletter to read? Subscribe or renew your subscription here, or by signing our Guestbook. If you are currently subscribed to our printed newsletter, you should receive a new one the next time we do our newsletter printing. If you previously ordered the tapes or CDs from LuminEssence, you can convert them to downloads and streaming of the same title for 50% off. To find out if you are eligible, you will need to create a Member's Account and then view "Special Member Offers." With membership, you can also view your past order history. You can purchase PDF transcripts of our audio courses If you own the tapes or CDs of the same title. Downloads and streaming audio have been digitally remastered, are high quality stereo MP3 files, come with a PDF with transcripts, and contain color cover artwork. Artwork on our website: Please note: All artwork on our site is copyrighted.